The Eva Solo Lunch Box – who knew bringing a lunch box to work could be classy? Going to work is expensive. You have to pay for accommodations near your place of employment which sometimes means uprooting your life, paying for gas or public transportation, and worst of all, lunch. It’s only one meal, but it can rack up a hefty sum at an alarming rate if you’re not careful. While making food at home isn’t too much cheaper (depending on what restaurants you eat at), it can save you quite a bit if you’re making enough for a few meals. If you’ve been wanting to cut back your spending and start making lunches to bring with you to work, why not spend a good hunk of dough on a singular lunch box (spending lots of money to save a little money makes sense, right?)? The Eva Solo Lunch Box was not made for Joe Schmoe. 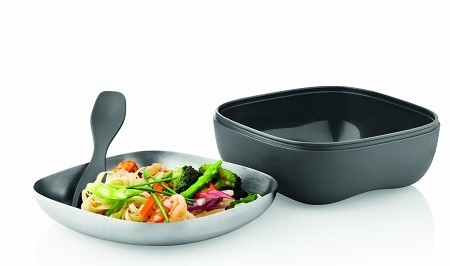 After you’ve heated your meal (if need be) in the plastic bottom, you can transfer it to the stainless steel lid which can act as a plate, and then you can use the built-in spork to dig in. When transporting your meal, a silicone band will surround the container to make sure that no particles of food try to escape. There are options of green or grey for the bottom aspect of this container, and you’ll be spending $52 or more on this box. This seems to be targeted at single people in the professional world who have always cooked their meals at home, but want a more elegant method of bringing their food to work. If you don’t like assigning yourself more work than you need, and don’t already bring your lunch to work, then this is one you’ll probably want to pass on.